Solesbee’s, a KINSHOFER company and leading manufacturer of quality heavy-equipment attachments, offers its Quick Coupler as an efficient solution for operators to exchange excavator attachments from the safety of the cab. 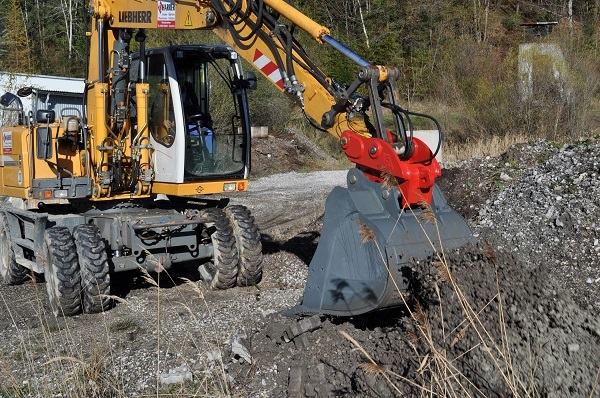 The coupler features a wedge-locking principal to connect to attachments in two places for ideal locking force and pairs easily with buckets, rippers, rakes and mechanical grabs as well as a wide range of demolition, forestry and land clearing attachments. When connecting attachments, the safety knuckle automatically engages onto the front pin, which can only be released by the operator. The self-adjusting wedge locks the second pin to secure the attachment as soon as the lock switch is deactivated. To disconnect, the system unlocks the self-adjusting wedge from the rear pin and then unlocks the safety knuckle from the front pin. If the attachment does not fully detach within a set timeframe, the coupler fully reattaches to secure it. Operators can customize the auto-lock time period from five to 12 seconds. Once disconnected, the safety knuckle re-engages and is ready to lock the front pin of the next attachment. The operator controls and monitors the entire exchange from the cab using the control unit. The unit’s separate open and close buttons, as well as an audible alert system, notify the operator when the wedge and safety knuckle are open or closed. To improve operator awareness, the system’s LED lights and beeping signal provide clear indication of whether or not the wedge has successfully captured the rear pin. Unlike competitive couplers, Solesbee’s wedge-locking principal connects to attachments in two places for optimal locking force — the wedge locks at 1,730 psi and unlocks at 3,455 psi. Constant working pressure continuously readjusts the wedge, keeping both pins firmly against the hitch while two pressure-relief valves keep the hydraulic circuit from over pressurizing, minimizing wear on locking components. A rear-lock safety device ensures the wedge does not retract and disconnect the attachment if hydraulic failure occurs. Solesbee’s offers four versions of its couplers, including hydraulic pin-to-pin, mechanical pin-to-pin, Nordic style s-lock, and tilt or tilt rotation. Each installs with just one hydraulic circuit and two hydraulic hoses, with all hydraulic components enclosed, reducing damage and replacement part costs. The durable couplers are made of high-alloy steel and available for excavators with 2,200- to 220,000-lb operating weights. Click here for more news from Solesbee’s!